Caroline married There is confusion between Caroline Roys,daughter of Augustus and Lucy Roys, and Caroline Roys, daughter of Hiram and Lydia Roys, if indeed they are two people. She was born on December 6, 1821 in Norfolk, Connecticut. 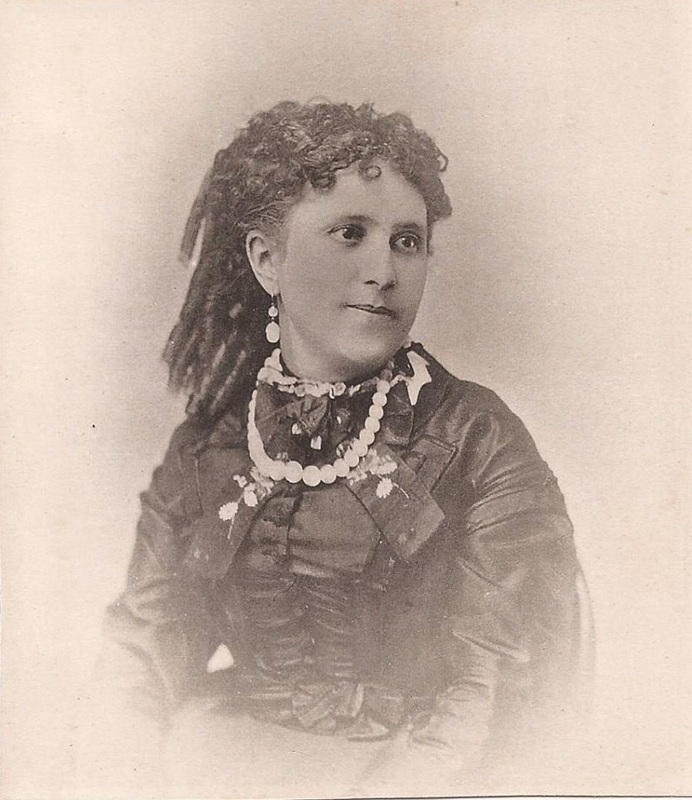 She was the daughter of Hiram Roys and Lydia Andrews. "Massachusetts Births, 1841-1915", database with images, FamilySearch (https://familysearch.org/ark:/61903/1:1:FXCB-5H3 : 1 March 2016), Charles Royce, 1862. Massachusetts Vital Records, 1841-1910, , Vol: 366 ; Page: 129. 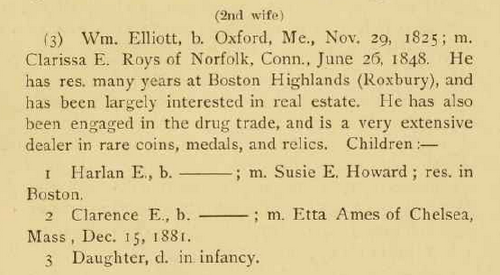 "Massachusetts, Deaths, 1841-1915," index and images, FamilySearch (https://familysearch.org/pal:/MM9.1.1/N7LT-6F7 : accessed 14 March 2015), Clarrisa E. Woodward, 02 May 1885; citing Boston, Massachusetts, v 366 p 129, State Archives, Boston; FHL microfilm 960,230. Daniel Roys was born in 1805. "Massachusetts Deaths, 1841-1915," database with images, FamilySearch (https://familysearch.org/pal:/MM9.3.1/TH-267-11900-66733-15?cc=1463156 : 20 May 2014), 2069519 (004292330) > image 1580 of 1864; State Archives, Boston. "Massachusetts Marriages, 1695-1910," database, FamilySearch (https://familysearch.org/ark:/61903/1:1:FCZ4-LQ2 : 4 December 2014), Edwin Royce Or Rice and Hannah Underwood, 28 Oct 1818; citing reference ; FHL microfilm 250,318. "New York Marriages, 1686-1980," database, FamilySearch (https://familysearch.org/ark:/61903/1:1:F634-W5W : 12 December 2014), Edwin L. Roys and Mary L. Coleman, 06 Oct 1869; citing reference ; FHL microfilm 1,310,907. "Florida Deaths, 1877-1939," database, FamilySearch (https://familysearch.org/ark:/61903/1:1:FP8K-VTM : 24 December 2014), Edwin L. Roys, 16 Apr 1929; citing St. Petersburg, Pinellas, Florida, reference cn6825; FHL microfilm 2,135,291. Ella Frances Roys was the daughter of Lorenzo Roys and Helen M. Watson. living at Prospect St., Wellington, Lorain County, Ohio. 1900 United States. Census Office. 12th census, 1900 population census schedules, Washington, District of Columbia: Bureau of the Census Micro-Film Laboratory, ([197-]) , 202/206. 1880 United States. Bureau of the Census. 10th census, Ohio, 1880 federal census : soundex and population schedules, Washington: The National Archives, ([19--?]) 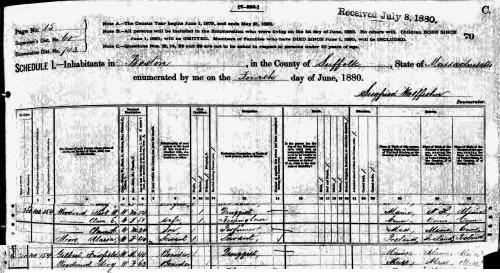 , Census Place: Wellington, Lorain, Ohio; Roll: 1042; Family History Film: 1255042; Page: 648B; Enumeration District: 183; Image: 0646. Erastus Roys was born perhaps about 1820. Theron Wilmot Crissey, History of Norfolk, Litchfield County, Connecticut, , at http://books.google.com/books?id=IOUnAQAAMAAJ . Everett, Mass. : Massachusetts Publishing Co., (1900) , p. 569. Ancestry.com, U.S. City Directories, 1821-1989 (Beta), [database on-line]. Provo, UT, USA: Ancestry.com Operations, Inc., (2011) , Louisiana > New Orleans > 1870 > New Orleans, Louisiana, City Directory, 1870 > 260. Erastus Roys was born on April 3, 1806 in Norfolk, Connecticut. 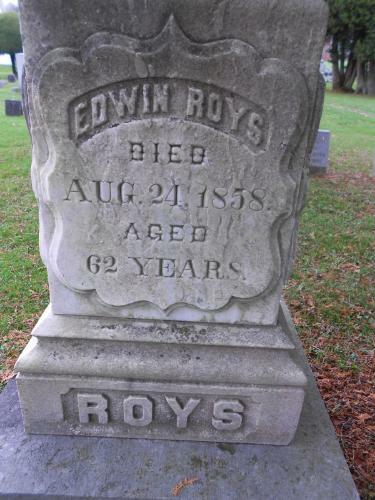 Erastus Roys was baptized on August 11, 1808 in Church of Christ, Norfolk, Connecticut. He was buried in South Cemetery, Norfolk, Connecticut. Erastus died on August 20, 1808 at age 2. "Massachusetts Births, 1841-1915", database with images, FamilySearch (https://familysearch.org/ark:/61903/1:1:FXZ4-5LM : 1 March 2016), Willie Rice, 1865.